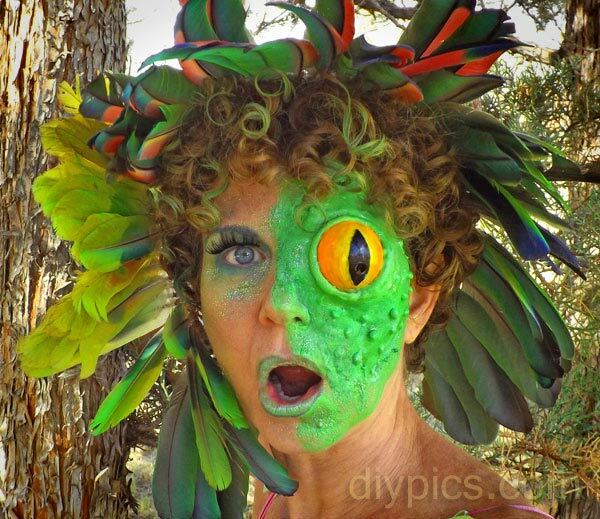 This frog face makeup is yet another in a series of fauxtex makeup ideas for Halloween or costume parties. It is ideal for people who are allergic to real latex. Fauxtex is a homemade substitute for latex made with tapioca flour, water, gelatin and solid coconut oil (though the oil is optional). It is easy and inexpensive to make, and is worth learning how to apply in different ways. 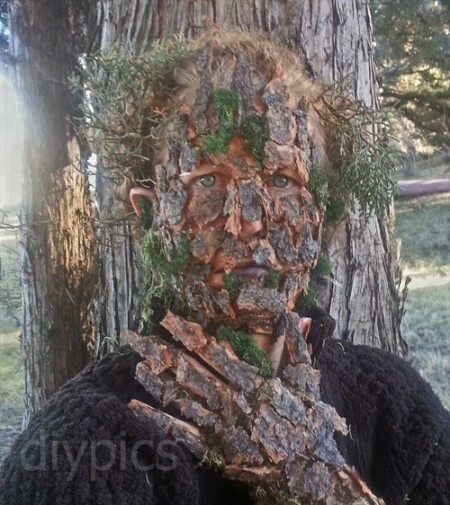 It can be applied directly to the skin and built up; it can be used as a glue for fur, hair, feathers and even tree bark (as shown below); and it can be formed into shapes that are then applied to the skin and painted. The video below shows how I made this frog face makeup, but I will explain it as best I can in writing. First, I made a batch of fauxtex using 1 cup water, 1/4 cup of tapioca flour, 2 packets of plain gelatin, and 1 tablespoon of solid coconut oil. I colored the batch of fauxtex with green and yellow food coloring while cooking it. Then I used a Styrofoam head and added playdough (using this homemade playdough recipe)to make a shape that resembled my face. For the eye, I cut a ping pong ball in half and painted it with permanent markers and clear nail polish. I then spread a little oil over the playdough, placed the eye in the eye socket and spooned warm fauxtex on top of the playdough to form the frog face. After the fauxtex set for about half an hour, I put dots of warmed-up fauxtex on top to resemble warty frog skin. The frog skin was allowed to set for two more hours before I peeled it off and applied it directly to my skin. Since fauxtex is a bit sticky, I used hand sanitizer on my fingers so it wouldn’t stick to my hands. I used a little bit of warmed fauxtex as “glue”, placed the frog eye over my eye (notice it has a hole so I can see through it), and applied the frog skin over the eyeball and onto my skin. I used more warmed up fauxtex to fill in gaps around the frog eye and to smooth out the outer edges. The video shows all of the above better than I can explain it.